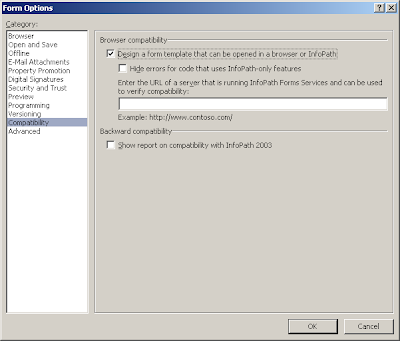 If you check the above list you will find that the combobox is not compatible, actually there is a subtle difference between the dropdown list and combobox, in InfoPath terms, the combobox allows the user to enter items into it, if the item is not listed in the combobox items. 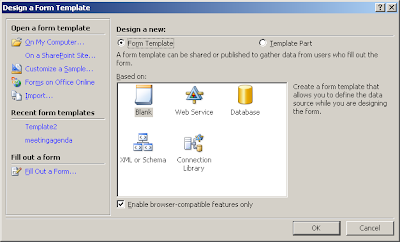 One of the cool features I like about InfoPath 2007, it can impose working in Forms Services compatibility mode, Launch InfoPath 2007, click Design a Form Template, check Enable browser-compatible features only, select the template type you want to design, from the task pane, click Controls, you will find that the toolbox is only populated with compatible controls, and all the other ones are not listed, such as Combobox, this is one of the good practices to design a browser compatible InfoPath form. 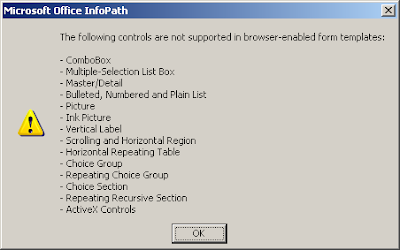 Once you click OK, and get the default template's view, view the Controls from task pane if it's not visible, you will find that all unsupported controls have been hidden and one note is written below the controls toolbox saying "Some controls have been hidden based on the current compatibility settings." Note: Template parts are not compatible with InfoPath Forms Services, in compatibility mode all the custom controls in controls toolbox are hidden, as the template parts are not supported.